We're going to talk a little about those differences today and why understanding them is so crucial if we wish to build financially successful cities and towns. An auto-oriented street is, quite simply, one built primarily for cars. Highways are obviously auto-oriented, but so are most of the streets and stroads in our cities. Are there multiple lanes of traffic in each direction? Are the lanes of traffic considerably wider than the average car? Do most of the businesses along the street provide their own parking lots? Is there a large distance between the street and the businesses or homes lining the street (because of parking, landscaping, etc.)? Are the intersections controlled with traffic signals? Does the street lack sidewalks? If you answered yes to one or more of the above questions, you're looking at an auto-oriented street. The good news is that there are plenty of fairly simple, affordable ways to begin to move an auto-oriented stroad in the direction of becoming a people-oriented street. What Does “Walkable” or "People-oriented" Mean? A people-oriented street is welcoming, safe and accessible for people in all forms of transportation but especially on foot. The buildings, sidewalks and other features are all scaled to people, not cars. Does the street have no more than one lane of traffic in each direction? Are the lanes narrow (not much wider than the average car)? Is parking either directly on the street or behind the buildings? Are the homes and businesses close to the street with amenities (like signage and windows) sized for people? Would it be relatively safe and feasible for a person to cross the street at any point, including the middle of the block? If you can answer yes to several (and ideally all) of the questions above, you're likely on a people-oriented street. The last question is perhaps the most telling indication of a people-oriented street. If you were to visit this street on a nice day, you should see a ton of people walking its sidewalks, visiting its businesses on foot, etc. A people-oriented street is not anti-car. Quite the contrary. A people-oriented street is pro-people — whether the people are walking, biking or driving. If there's one thing you should take away from this discussion of walkable streets, it's the necessity of narrowing many of our roadways (items 1 and 2 on our checklists). The other features mentioned above — on-street parking, sufficient sidewalks etc. — are all fairly meaningless if you don't have narrow streets. It can actually be harmful to invest in these sorts of features if you don't also narrow the streets around them, because you're sending the mixed message to people that a) they should walk there, but b) it won't actually be safe for them to do so because cars will be driving too fast. Not to mention it's a waste of municipal funding to build a beautiful new sidewalk that no one is actually going to use because it's dangerous and unpleasant. So why does building people-oriented streets instead of only car-oriented streets matter? It's not only because they're safer or because they enable people to get around affordably without a car. It's also — and chiefly — because they are more economically productive. They encourage local business activity, produce more tax value per acre and offer a better return on infrastructure investment. Learn more about why walkable streets are more economically productive. 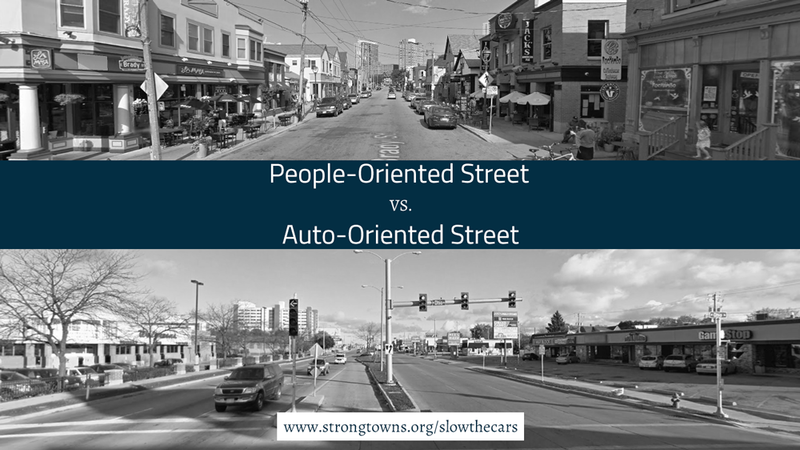 Does your town have more auto-oriented streets or people-oriented streets? Let us know in the comments.